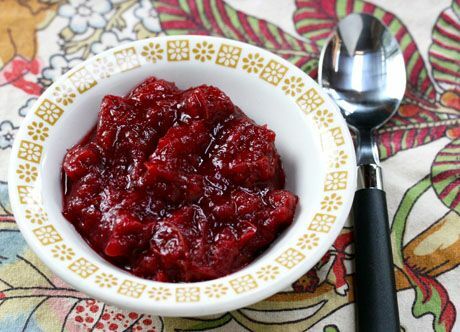 Slow Cooker Cranberry Sauce frees up space on the stove, and you don’t have to watch it while it’s cooking! Check out The Top Ten Recipes for Slow Cooker Cranberry Sauce from food bloggers for some delicious ideas. 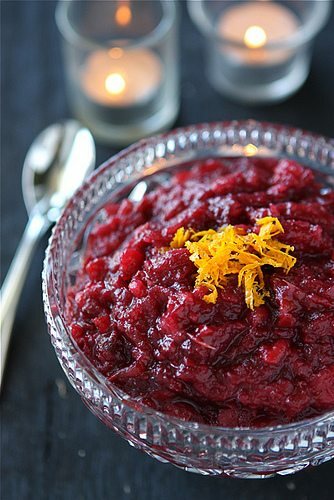 Click to PIN The Top Ten Recipes for Slow Cooker Cranberry Sauce! Click here to see 50+ Ideas for a Slow Cooker (or Instant Pot) Thanksgiving! Thanksgiving is coming whether we’re ready or not. 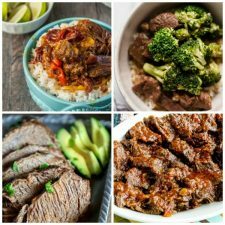 I love Thanksgiving, and enjoy sharing lots of ideas for Thanksgiving dishes in the slow cooker, and a few in the Instant Pot too. I have all those collected in a great round-up of 50+ Recipes a Slow Cooker or Instant Pot Thanksgiving, but I want to give a special shout-out for the Top Ten Recipes for Slow Cooker Cranberry Sauce. Making cranberry sauce in the slow cooker is the perfect way to control the amount of sugar, or use your preferred sweetener and make a lower-sugar cranberry sauce if you prefer. 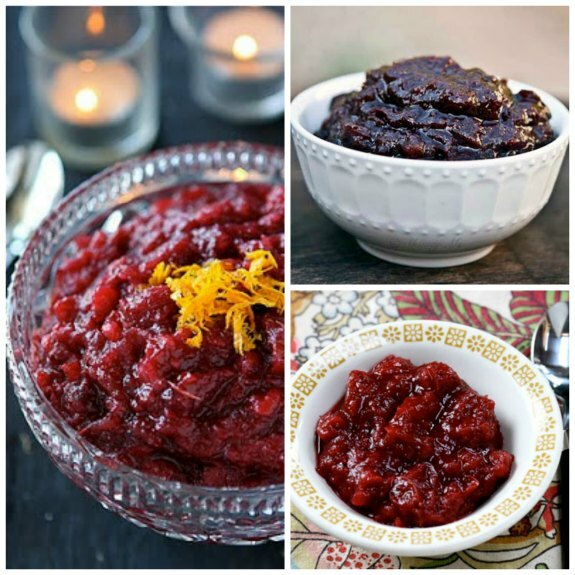 And don’t you agree that these slow cooker cranberry sauce recipes all look delicious! All photos are copyrighted by the blogger who posted the recipe. Just click the recipe title under each photo to see that recipe on the original blog. Check out all our Thanksgiving recipes below if you want even more ideas for using the slow cooker or Instant Pot to help with Thanksgiving dinner! First up, the gorgeous Crockpot Apple and Cranberry Sauce with Orange and Crystallized Ginger from Cookin’ Canuck shown above. This sauce cooks for eight hours in the slow cooker, so you might want to cook it overnight and then warm it up in the slow cooker on Thanksgiving day. A slightly different sauce that also features orange and ginger flavors is the Slow Cooker Cranberry Sauce from The Lemon Bowl. For this recipe whole cranberries cook in the slow cooker with water, orange juice, sugar, orange zest, and grated ginger. 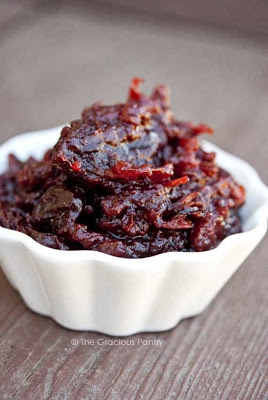 The Slow Cooker Cranberry Sauce from Emily Bites includes Weight Watchers information for anyone who wants it. At Kitchen Parade you’ll find a recipe for Slow Cooker Whole Cranberry Sauce that was sent by a reader, and Alanna confirms it’s a winner! At A Year of Slow Cooking I found a slightly different version of Slow Cooker Homemade Cranberry Sauce that starts with fresh or frozen whole cranberries. This recipe has a touch of cinnamon. 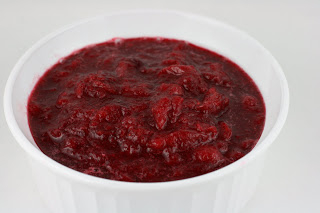 The Gracious Pantry has Clean Eating Slow Cooker Cranberry Sauce. 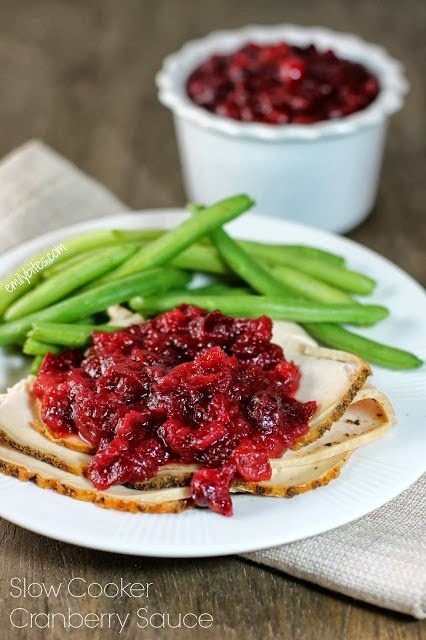 For anyone who wants cranberry sauce without added sugar, this Sugar-Free Slow Cooker Cranberry Sauce from The Perfect Pantry has whole cranberries cooked in no-sugar added apple juice or apple cider, and is sweetened with Splenda or another sweetener of your choice. At Heather’s Dish, Heather says she started making CrockPot Holiday Cranberry Sauce to help with scheduling on Thanksgiving, and that sounds like a good reason to me! 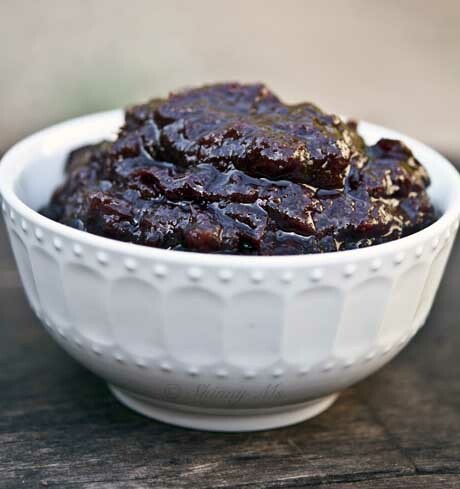 Slow Cooker Cranberry Sauce from Burnt Apple is sweetened with maple syrup. 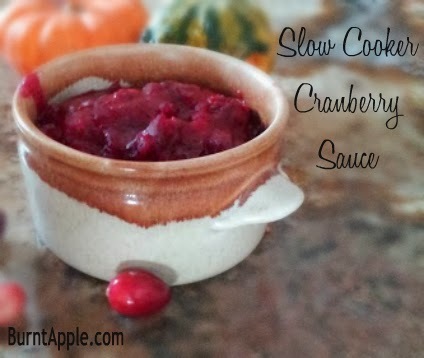 And one more slightly different idea for Slow Cooker Cranberry Sauce from Skinny Ms. This one has orange juice, cinnamon, and is sweetened with honey. A Thanksgiving feast is never complete without a really good cranberry sauce. Thanks so much for including mine, Kalyn! Dara, my pleasure. Your sauce looks amazing! What a neat idea – making cranberry sauce in a crockpot – I love my crockpot during holiday season. It's like having an extra stovetop. Jeanette, I agree that this is a great idea to free up the stove! And I love the idea of having warm cranberry sauce. Thanks so much for including my sugar-free recipe. 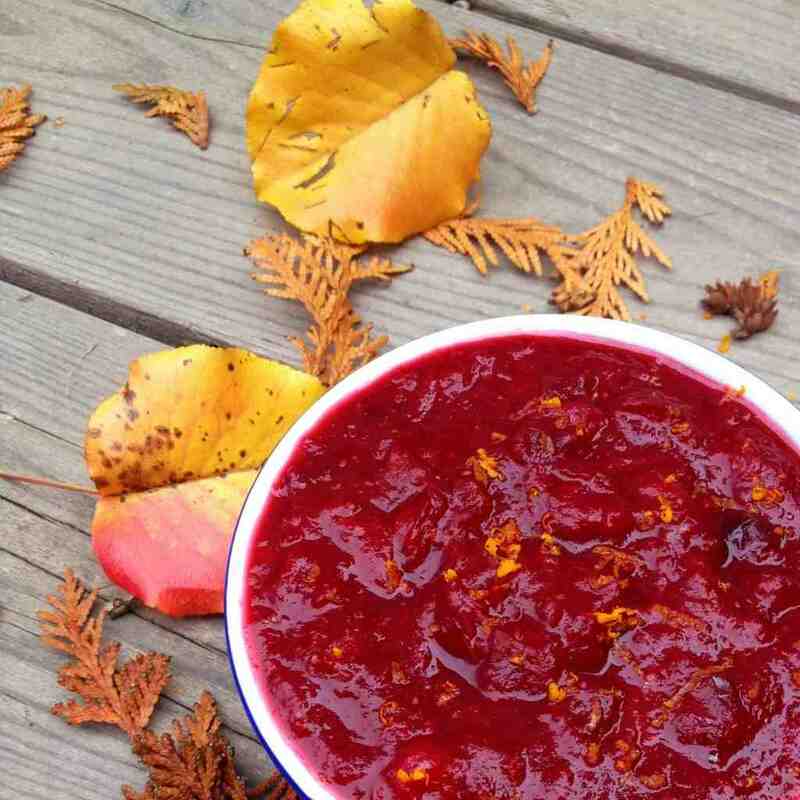 Cranberry sauce is a must on our Thanksgiving table. Lydia, such a great idea! 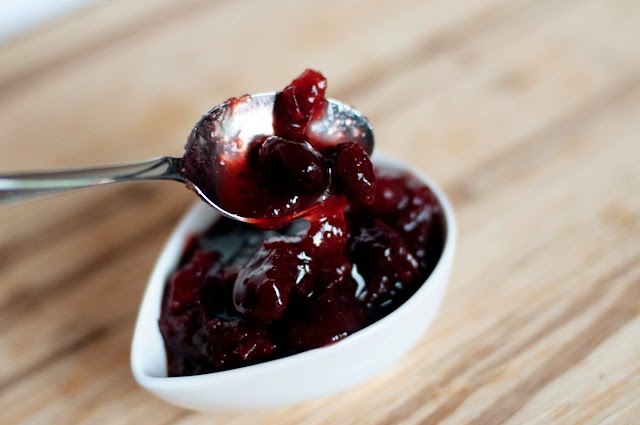 Thank you so much for including our cranberry sauce. We are going to keep ours to make sandwiches with the day after Thanksgiving. So excited for Thanksgiving this year! Traci, that sounds so good!